Summary: The UK prison system is in crisis with the highest population ever and cuts in the prison service leading to high levels of violence and self-harm. Drug use is virtually uncontrolled in many prisons and the imprisonment rate in the UK is the highest of any Western European country. Almost all children under the age of 18 are kept on remand even though three quarters are not ultimately given a custodial sentence. One solution that would reduce the prison population dramatically would be to use much more widely the new high-technology tags that allow precision tracking of the location of an individual. Releasing non-violent and nonsexual offenders could be tagged after one third of their sentence. Initially they would have relatively restrictive constraints on their movements. This approach would make it much more likely that many could be reintegrated into the community and stopped from reoffending. Using such tags for individuals that might otherwise be kept in remand would also reduce the prison population markedly. The UK has a very large prison population, currently nearly 150 per 100,000 of the population giving a total of around 85,000. Cuts to the prison service (staff numbers reduced by 30% since March 2010) have led to an explosion in violence and the rates of self-harm. Drug use is endemic and a number of prisons are simply out of control. The numbers sentenced to 10 years and more have increased by over 200% in 10 years. 36% of prisoners have a physical or mental disability. Comparison with many European countries shows that prison sentences in the UK are particularly harsh. The number of prisoners in jails here is almost three times the rate in the Netherlands and several other Western European countries. For many years the running on this has been led by the right, emphasising punishment and not rehabilitation. The conditions in prison make any attempt at training that might lead to successful rehabilitation virtually impossible. This in turn leads to very high rates of reoffending, about 45% for adult offenders and particularly high for shorter sentences. A great deal of the reoffending is related to drug and alcohol misuse. The prison population is significantly larger than it needs to be because of people kept on remand in custody awaiting trial. At any one time the remand population is around 11,000. In one year approximately 50,000 people are remanded into custody, 11,000 were subsequently acquitted and about 14,000 were given non-custodial sentences. On average a remand prisoner spends nine weeks in custody. Amongst under-18-year-olds three quarters are locked up on remand are either acquitted or given a community service. Imprisonment of children can be particularly damaging. Bail applications for under-18-year-olds are almost always refused despite the fact that only one quarter are actually given a custodial sentence. The remand population could be reduced if those likely to face a non-custodial sentence were left in the community and also if the time it takes to bring a remand prisoner to court was reduced. At present offenders sentenced to less than one year in prison are incarcerated for half that time and then released for the remainder of their sentence on community service with no licence conditions and no supervision. Between one and two years sentence, again only half is served and the remainder given a mixture of post sentence supervision and licence. Pressure on the probation service (also widely agreed to be in a state of crisis) means that many of these relatively short-term prisoners are not followed up on at all seriously unless they reoffend. 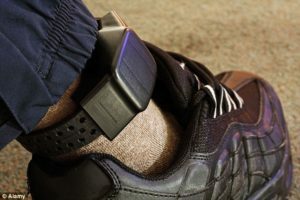 Prisoners serving sentences between three months and four years are usually granted early release between two weeks and 135 days earlier than their normal release date provided they wear a “tag”. A tag monitor installed in the offender’s home alerts the monitoring centre if the prisoner leaves home during curfew hours. These tags are really quite basic. Any breach of the curfew can result on the offender being returned to court or even sent back into custody. Outside curfew hours released offenders can go where they please. Offenders as well as those on remand are kept in prison and placed on curfew in order to restrict their liberty. Modern technology allows the location of an individual at any time to be tracked with very great accuracy and stored within a simple device little bigger than a wristwatch. The technology is essentially what everyone has in their smartphone, relying on GPS for precision location detection. The movements of an individual may subsequently be downloaded and checked automatically to ensure that the individual stayed within areas already approved. Contracts to create such intelligent tags have already been placed and are beginning to come into use. These contracts are with four companies to a total cost of nearly £230 million. That does seem remarkably high particularly as the anticipated savings are in the region of £20 million compared with the existing low-tech tag regime. One approach to reducing prison numbers would be to use these modern tagging technologies much more widely than currently envisaged. An early release offender or an individual on remand could be subject to very clear constraints on where he or she may go and at what times. The individual needs to be supported in maintaining their life, family contacts, capacity for taking on a job or continuing their education while being constrained to a greater or lesser degree as to where they might go. Increasing the numbers tagged in this markedly more restrictive way would make it practical for many more to be tagged. For example, an individual may be initially constrained to stay at home and only go to specific supermarkets or places of work in specific time windows and then return home. The movements of the individual would be downloaded regularly while the individual is at home with the monitoring unit passing data to the central management organisation. Provided the movements of the individual are consistent with the terms of release those terms may be updated and relaxed somewhat after a period. An individual could be permitted to attend training courses or rehabilitation programs and the tag would give evidence that those were indeed properly taken. Underage children would be able to continue with their school education. A future development could further increase the utility of these intelligent, high-technology tax. Modern transdermal alcohol sensors allow excessive use of alcohol to be detected and measured. Similar technologies allow the detection of drug consumption. In principal these new technologies could be used to improve the capacity of the intelligent tags to monitor the drug abuse and alcohol abuse that is often a precursor to reoffending. The prison population could be significantly reduced if the 60% of all prisoners who were sentenced for non-violent crimes or for non-sexual crimes were released after one third of their sentence and tagged with one of these modern tags for the second third of their sentence. Those that consistently violate the terms of their release could be brought back into custody. The effect of this would be to reduce the prison population by about 16,000. Offenders convicted of violence against the person or sexual offences could be released under similar conditions provided it was clear that they no longer posed a threat to the community. This would likely further reduce the prison population by perhaps 4000. Taking the same approach to the great majority of remand prisoners could reduce the prison population by another 5000 perhaps. The overall effect could be to reduce our present prison population from 85,000 to around 60,000. Such a reduction would have a major effect on the overcrowding in UK prisons. It would allow much more serious work to be undertaken to re-educate and rehabilitate prisoners prior to their release. The tags and the tag monitoring systems would not be particularly expensive and much of the monitoring can be done automatically without human involvement until there is a violation of the tagging conditions.